Let’s see, now. I shared that I decided to use what I had for Tommy and Teddy’s birthday, so let’s take a look at some of the presents! How cute are these two? 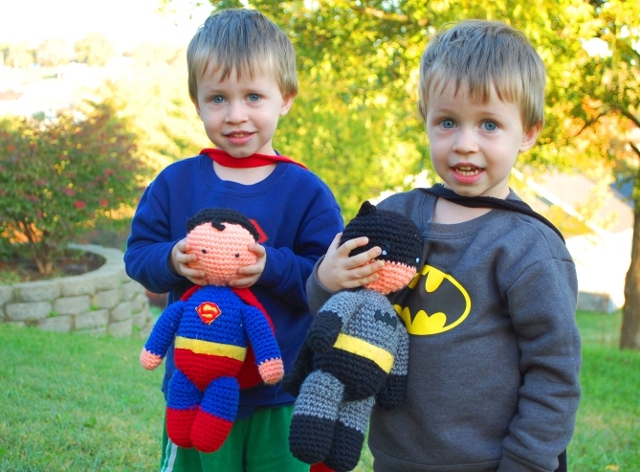 Obviously the crocheted Batman and Superman took center stage in the birthday presents. Yarn? Check. Stuffing? Check. Felt? Check. Those guys were free, and they are a definite hit. The twins carry them around, lug them in their little red plastic wagon, and make them “fly” across the room. They even go to sleep with them. And who can blame them? They’re adorable! AND, through a rare display of focused effort, I have actually written a pattern for each of them and made them available to purchase! Already! Head over (click here for Batman, and here for Superman) and don’t forget the code that will let you snag them for 50% off! (Read the post on using what you have if you didn’t get it yet.) I love them! Now, I also made them each a t-shirt cape with their hero’s logo on the back (using some t-shirts and printable iron-on transfers that I had) and a sweatshirt with another logo ironed on. You can’t see the capes very well, but I’m going to cover those in another post. I bought the sweatshirts, and I also bought them each a new ball and a ball-catch-game to play together. That breaks down to approximately seven dollars per child – not bad for a very well received three-year-old birthday. This entry was posted in Make it in Minutes, Other Projects, Patterns. Those are the cutest superheros I have ever seen. They look very well made! I found you through Hookey, by the way. Adorable. The dolls are pretty darn cute too. Thanks for sharing on BeColorful. How do I get the patterns? The toys are almost as adorable as the little boys! Hi, Nancy. 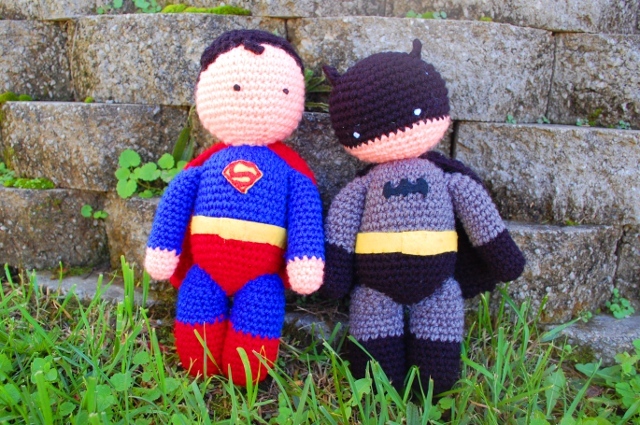 You can find the Batman pattern here: (http://www.innerchildcrochet.com/patterns/sale/myhero_batman.php) and the Superman pattern here: (http://www.innerchildcrochet.com/patterns/sale/myhero_superman.php). I’m glad you like them!